The inevitable step down from office of Paul Wolfowitz, the president of the World Bank, finally occurred on May 17. For more than four weeks, the effective operations of the World Bank had been paralyzed over allegations that Wolfowitz improperly approved a raise for his romantic companion, a senior staff of the institution, who moved to the State Department to avoid a conflict of interest during his tenure. While this was played out in the Bank and the media, another angle to the controversy emerged: the irreversible breakdown in the relationship between Wolfowitz and World Bank staff. With Wolfowitz's resignation, the World Bank now is gifted with another opportunity to comprehensively review its mission and renew its partnership with the poor around the world. Just before Wolfowitz assumed office in 2005, I had written on the need for the then incoming president to "provide guidance on how best to mesh the extraordinary knowledge base of brilliant World Bank staff members with the urgent, real and practical need to end poverty as we know it." Clearly, this advice did not become a reality as the reported animosity between the president and the World Bank staff gradually reached a boiling point. Should the World Bank be about poverty alleviation or wealth creation for the poor? Can the World Bank successfully manage both macroeconomic policy interventions and infrastructure development in recipient countries at the same time? The new president of the World Bank will face the same challenges that Wolfowitz faced in 2005, and more in view of the unflattering scrutiny the institution has endured in the last few weeks. I briefly discuss the current challenges. First, the new president will face the challenge of how to reform the institution so that it impacts directly on the lives of the poor men and women it purports to serve. The new president will decide whether to narrow the core mission of the institution to a few, achievable objectives or partner with other specialized institutions. 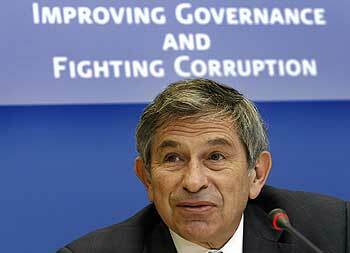 For example, in the bank's anticorruption initiative, the new president will decide to either continue with Wolfowitz's current initiative or partner with institutions such as Transparency International, Interpol and other organizations with more specialized staff complements. The new president will also have to make a decision on whether the Bank can simultaneously manage two distinct activities with different configured staff complements at the same time or choose one major activity. For example, can the World Bank simultaneously focus on macroeconomic stability in recipient countries at the same time it is managing ambitious infrastructure projects in the same recipient countries? How many men and women move out of poverty directly as a result of World Bank interventions? How many communities have seen their poverty rates go down in a defined period of time (years) because of World Bank interventions? How many countries in resource-challenged regions of the world are no longer poor after years of World Bank interventions? How many artisans with marketable skills in resource challenged parts of the world are now gainfully employed and supporting their families as a result of World Bank interventions? Second, the new president of the World Bank will have to realign the activities of the institution to reflect the fact that poor countries now have access to alternative sources of financing. For example, poor countries in Africa increasingly have access to soft loans and grants from China, with limited exhortations on governance reforms. Another reality is that remittances from citizens living abroad are growing and providing economic life support for the poor in recipient countries. The governor of Nigeria's Central Bank recently stated that Nigerians living abroad sent home $7.7 billion in 2006, an amount the governor reported is higher than the G.D.P. of 29 African countries. The estimated 12.6 million immigrants in the United States earn about $500 billion a year, and, send back at least 10 percent of the income to their native countries. Another reality in financing is that individuals, foundations, and philanthropies are increasingly becoming important sources of money for poverty-related activities in the world. In 2005, more than $95 billion donated to the developing world came from American private donors and charities. This level of support is nearly four times the American government in foreign aid assistance. In addition, microfinance facilities are spreading from Asia to Africa as governments set regulatory frameworks for the poor to borrow small amounts of money with minimal collateral to establish a new business or expand existing ones. Germany is reportedly going to press its fellow Group of 8 members at the June summit to establish a new micro-credit fund for African small-scale entrepreneurs. These alternative sources of financing were not a factor when the World Bank was established in 1944. Third, the new president of the World Bank will also face the challenge of how to mobilize the talent and energies of its 10,000 sophisticated and educated staff to assist the poor escape poverty and improve the social and economic conditions of their families. The incoming president needs to work with the staff and carry them along in proposed reforms and reconfiguration of responsibilities in the institution. This mobilization may include the difficult task of moving a significant proportion of staff out of Washington and into the field to increase the impact of the institution's programs on the target population. Fourth, the World Bank needs to tighten its internal oversight and controls. Both the outgoing president and the bank's executive directors agreed that urgent steps needed to be taken to strengthen the internal governance framework, including ethics rules. This is an urgent task of the incoming president. All bank staff should have unambiguous guidance on ethics and governance as the institution steps up its battle against corruption in its financed programs. Finally, the new leader of the World Bank will not move the institution forward by focusing on charismatic leadership or aggressive press relations. I believe that the new president of the bank should focus initially on reorganizing the institution to face current challenges. The new leader should set a vision and a roadmap that realigns the institution's operations with the realities on the ground as experienced by families that live in poverty. The new president needs to put more staff at work on the ground and should implement evaluation mechanisms that document the change in the poverty status and quality of life of target populations.